Viewed over a 15-year period, some trends suggest, a brand’s franchisees benefit from Roark’s involvement through improving unit revenues. However, do not bet on faster franchised unit growth. 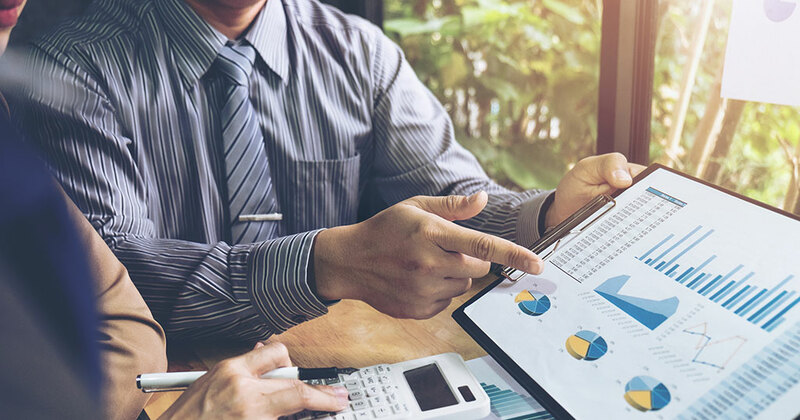 A review of Roark Capital Group’s performance since 2001 sheds light on how stakeholders – the PE group, the franchisor, and the franchisees – can benefit in different ways. Roark Capital Group has made a name for itself as one of the best-known investors in the U.S. franchise world. In total, franchise brands affiliated with Roark control well over 20,000 locations in the United States. Several concepts operate additional international locations. After a shopping spree that began in 2014, Roark acquired Buffalo Wild Wings for $2.9 billion in November 2017. Included in the purchase was R Taco, in which Buffalo Wild Wings owned an 80% share. Together with Arby’s, these two new brands are now part of Inspire Brands. Buffalo Wild Wings ticks all the boxes of Roark’s investment criteria, including an experienced management team, predictable cash flow, identifiable growth, and a sustainable competitive position. Many commentators viewed the planned acquisition through Roark subsidiary Arby’s Restaurant Group as a turnaround project. The wing brand has shed some feathers over the past years, and Roark’s successful turnaround of Arby’s has already boosted BWW’s share price. Is this optimism justified? Can Buffalo Wild Wings expect a repeat of Arby’s revamp? Based on Roark’s previous investments, the brand’s franchisees will be happy to know chances are that their average unit revenues are likely to pick up. However, as far as franchised unit growth, Roark’s track record is mixed. Great brands, great resources, great story? Perusing older press releases about Roark’s first investments, it seems the group simply acquired established market leaders to maximize their potential. However, already with these early investments, Roark had to invest in turning around lagging or bad performers. The press release failed to mention the decline in Carvel’s franchised unit counts, which had dropped at a compound annual rate of 6% between 1998 and 2001. A year later, Steven Romaniello replaced Fellingham and Carvel managed to grow the franchise system again. Unfortunately, the post-acquisition growth trend reversed after the recession hit in 2008. As of 2016, Carvel still operated about 100 fewer franchised locations than in the three years leading up to its acquisition. Again, the messaging focused on future potential. No words about the stagnation that had set in at Fastsigns at the time. The number of franchised units had remained flat, increasing at a compound annual growth rate (CAGR) of just 1% between 2000 and 2003. Over the same period, average unit revenues did not move any faster. Contrary to Fellingham, however, Salomon kept his job until 2009 when he became chairman. Today, Fastsigns operates roughly 200 more franchised locations than during the year Roark got involved. The acquisition of Auntie Anne’s in 2010 turned out to be a very different story. Reportedly, it all began with a phone call between Erik Morris from Roark and Auntie Anne’s then-owner Sam Beiler, a distant relative of the founders. Like Fastsigns and Carvel, the concept was a market leader. Unlike Carvel and Fastsigns, it was already on a great trajectory before Roark got involved. It just happened that Beiler wanted to pursue other opportunities. Roark simply bought a well-performing system, a trend that continued after it was acquired. For Corner Bakery Cafe’s acquisition, the press releases made noises similar to what had been said about Carvel and Fastsigns. This time, however, the talk about the “terrific brand” (Aronson) and Roark providing the brand with “unique opportunities” (Mike Hislop, CEO of Corner Bakery Cafe’s franchisor) appeared a little closer to the actual reality on the ground. Corner Bakery Cafe had beaten the market in terms of franchised unit growth. Average unit revenues had stagnated. but quickly improved after Roark took over. Fast forward to November 2017 and to Roark Capital Group’s pitch for Buffalo Wild Wings. Based on Roark’s portfolio of franchised brands and their performance since 2001, what can Buffalo Wild Wing’s franchisees expect? To find out, I examined franchised unit growth and average unit revenues for the three years before Roark acquired a concept and compared these trends to the three years immediately following Roark’s involvement. This excluded brands that were acquired after 2013 as the relevant information for 2017 was not available. Franchised unit count data existed for 29 brands, while average unit revenue information was disclosed in the FDDs for 11 brands. As shown in the graph below, Roark acquired 12 brands between 2014 and 2016 alone. It will be interesting to revisit this analysis in a couple of years. In the context of U.S. GDP and overall franchised unit growth, it is noteworthy that Roark brands did not perform significantly better. For example, between 2001 and 2016, the number of franchised units controlled by Roark brands increased at a CAGR of 4%. This compares with a CAGR of 4% for the U.S. GDP over the same period and a CAGR of 3% for all franchised units in the United States. Reviewing the three-year period before and after Roark’s acquisition of a brand in detail reveals a mixed bag. Regardless of the year of acquisition, Roark brands had an average 6.6% total unit CAGR for the three years before the acquisition. Once adjusted for outliers, this rate did not change significantly for the first three years after Roark’s involvement. This means that the average brand did not grow faster after Roark’s investment. A better comparison is to review these growth patterns based on the year of a brand’s acquisition. The table below provides additional details on franchised unit growth. Out of 15 brands, six performed worse than the market when measured by franchised unit growth in the three years before their acquisition. For example, Fastsigns grew at a CAGR of just 1% between 2000 and 2003 compared with 5% for all of franchising. Similarly, Schlotzsky’s bled units between 2003 and 2006, while the overall U.S. franchise market grew at a CAGR of 4%. The same applies to Arby’s, acquired in 2011; and Carl’s Jr. and Hardee’s, both acquired in 2013. I am assuming that Carvel’s performance was worse than the market in the late 1990s. Post-acquisition, Roark brands also show a mixed performance. Either their growth rate slowed or performed below the market. For starters, seven brands decreased their three-year CAGR, following the market. However, Money Mailer, Cinnabon, and McAlister’s were acquired after the recession, which means that the economy alone cannot explain that. Moe’s Southwest Grill and Primrose Schools were acquired during the recession, while Wingstop and Massage Envy were acquired post-recession, in 2010 and 2012, respectively. In addition, four brands performed below the market in the relevant periods. They include Fastsigns, Cinnabon, Schlotzsky’s, and Arby’s. To be fair, Fastsigns improved its franchised unit CAGR over the post-acquisition period, but not at a rate comparable with the market. The same applies to Schlotzsky’s. Conversely, Carvel, Carl’s Jr., and Hardee’s are the best stories for Roark. Once Roark got involved, they grew and outperformed the market after having either lost franchised units or stagnated during the three years before the acquisition. 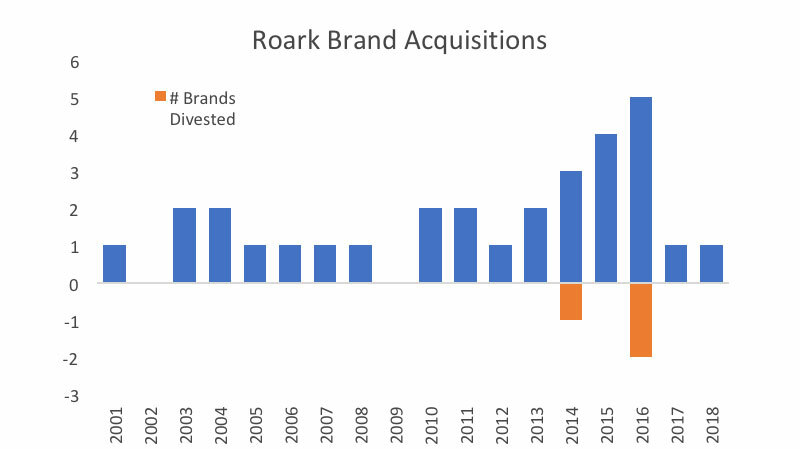 Overall, while some brands grew faster after they were acquired by Roark, it does not seem that there is a correlation between ownership through Roark and faster franchised unit growth. 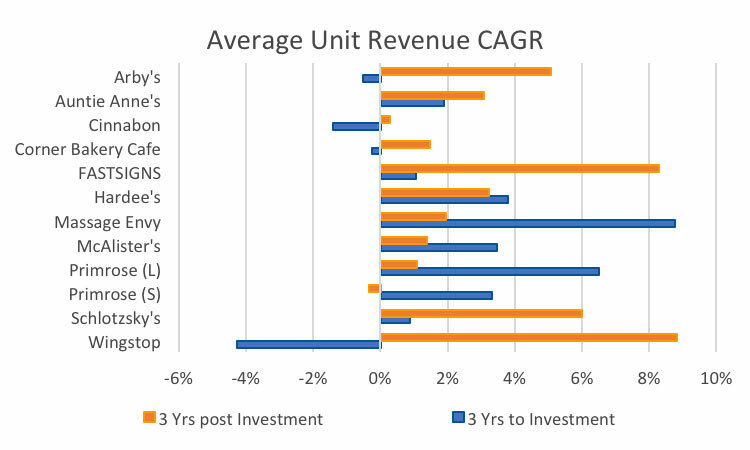 That leaves us with an analysis of average unit revenue growth. It was possible to examine unit revenue information for 11 brands. Primrose disclosed unit revenues broken out by small and large facilities. Clearly, here are signs that Roark’s involvement has a positive impact on a brand. On average, unit revenues increased at a CAGR of 1.9% for the brands in the three years before they were acquired. Post-acquisition, the Roark brands grew their unit revenues at an average CAGR of 3.4%, an increase of 1.5 percentage points. Not all brands benefited the same from Roark’s involvement. Four concepts showed slower revenue growth after the acquisition, and of these, small Primrose facilities actually decreased their average unit revenues after Roark’s involvement. A couple of noteworthy brands are Arby’s and Schlotzsky’s. While Arby’s franchised unit CAGR remained negative, its average unit revenues increased at a CAGR of more than 5% once Roark started managing the concept. Schlotzsky’s also continued to lose franchised units, but at a significantly lower rate, while drastically increasing average unit revenues. In both cases this could have been due to a combination of rising revenues and closing down underperforming locations. If one were to rank Roark’s brands based on unit growth vis-à-vis the market and increasing unit revenues, then Auntie Anne’s and Corner Bakery Cafe feature as the clear winners. Their franchised unit growth beat the market pre- and post-acquisition. They also managed to increase their average unit revenues. Based on their pre-acquisition performance, it seems Roark picked winners from the start. Arby’s, McAlister’s Deli, Moe’s Southwest Grill, and Money Mailer form the rear guard. *No unit revenue data available for required period. Based on the simple ranking above, once Roark acquires a brand, it is most likely to continue to beat the market in terms of franchised unit growth after Roark’s involvement. As most brands that performed better than the market after the acquisition already did so before Roark’s investment, we can conclude with certainty that a Roark investment did not harm them. As mentioned earlier, the acquisition targets tended to have strong franchised unit continuity rates to begin with, presenting Roark with a solid foundation. For less than half the examined brands, I could verify improved average unit revenues. This share is likely to be higher given that only 11 of the 29 brands disclose such information in their FDDs. Optimists about Roark’s acquisition of Buffalo Wild Wings should therefore not necessarily expect fast franchised unit growth. Just because Roark buys a brand, it does not follow that its performance goes up within a short period of time. The franchisees, however, stand a good chance of going through a period of revenue growth. Arguably, stable and sustainable franchised unit growth paired with revenue increases are more important than rapid franchised unit growth. When is the time to exit? For the investor, it is all about the exit. Roark is somewhat unique in that it tends to hold brands for a long time. As of April 2018, it has sold only three brands since 2001 (Fastsigns, Wingstop, and Batteries Plus Bulbs). Roark managed to successfully exit its investments in Fastsigns in 2014, 10 years after it had acquired the concept. According to press reports, it had invested $15 million into Fastsigns and returned $30 million through two recaps. In 2014, Roark expected bids of 10x EBITDA (which was just under $10 million in 2013). Divesting its Wingstop investments proved even more lucrative for Roark. The brand’s franchised unit growth rate had beaten the market when Roark acquired it in 2010 for an estimated $80 million to $90 million and continued to do so. Roark’s contribution post-acquisition was to significantly improve average unit revenues. As a result, when Roark sold, it grossed a total of more than $555 million. In the end, the player who puts down most of the money seems to gain the most. Next come the franchisees, and then the system. Based on the analysis, Roark seems to care less about franchised unit growth, instead focusing on long-term sustainable revenues. Investors in publicly traded brands like Buffalo Wild Wings should not anticipate a bonanza. Based on past performance, they can reckon with stability. One last word about future trends. As mentioned before, it will be interesting to revisit this analysis in four years to examine the post-acquisition performance of Culver’s, Buffalo Wild Wings, and Jimmy John’s. For example, if Buffalo Wild Wings and R Taco follow the average trend, their average unit revenues would increase to more than $3.4 million and $1.24 million, respectively. In addition, analysts should keep a close eye on brands like Drybar, R Taco, Take 5, and Waxing the City. Contrary to all previous investments, these were all relatively small franchise players when Roark acquired them.